Can you see the 'etching' in the thick paint? This was my first thought... but after eating lunch and coming back to it... it changes by tomorrow. 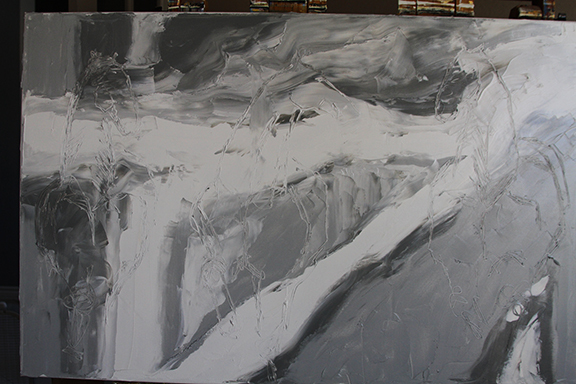 The first problem was solved and that was getting the values of grey onto the canvas with the black and white into a composition of movement that I like. The next problem is to figure out the composition of the horses. There is a ride ahead with the journey so stay abreast with my blog. Inspiration is a necessity for an artist to work. An uninspired artist is basically still in the water... or still in the paint you might say. Something has to change to break back in the light of working on a painting. Everyone of us deals with momentum and inspiration on a daily basis. What do you do to find it? In centuries before us, people would wake with the sunrise and turn toward the sun to honor it for its light and warmth. That is what sustained man... his existence depended on the sun. Even on rainy days or cloudy days they would continue to rise and face the east, knowing the light source was present. When I am in that anxious place unable to paint or produce, I have to turn myself to prayer, which is for me the light of God. I do not have to face east or west... I simply close my eyes and remove myself in thought from the negativity spinning in my head. I focus on breathing and emptying my mind to allow the light of God to fill my soul. It is this light that brings a peace and awareness and with it the knowledge that I can be renewed. I can live this day to its fullest.